The beach is located one mile south of Cardiff on Old Highway 101. Pardon our dust (and sand)! The Cardiff State Beach Living Shoreline Project is underway. The purpose of this project is to construct a dune system on the seaward side of Highway 101 on Cardiff State Beach to protect a vulnerable segment of the roadway while providing native dune habitat on this 0.5 mile segment of beach. The project also includes a new, full-length trail between Highway 101 with designated beach access points through the dunes delineated with post and rope fencing. This project will beautify, protect and improve habitat along this stretch of Cardiff State Beach. 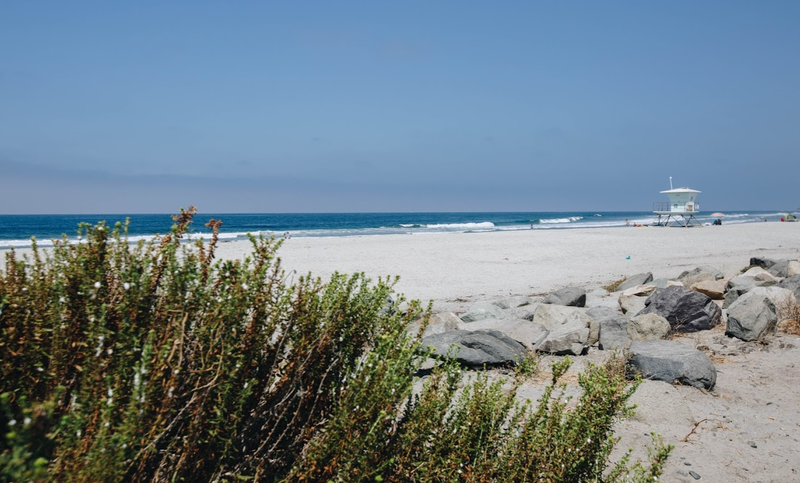 The living shoreline is a partnership between the Department of Parks & Recreation, the City of Encinitas, the California State Coastal Conservancy, the United States Fish and Wildlife Service, and the San Elijo Lagoon Conservancy. The project should be complete in May 2019. Dogs are permitted on Cardiff State Beach. All dogs must be on leash at all times. Beach Wheelchairs are now available for patron use. Check out the wheelchair with a photo identification at the San Elijo State Beach Campground entrance. There is no fee charged for the use of the wheelchair. It is available on a first come, first served basis. During the summer season, a Mobi Mat is placed at Lifeguard Tower 15 to provide a firm access surface to the mean high tide line. This mat will permit an easier pathway to access the beach. Lost and found is located at San Elijo State Beach Campground. If you are interested in having a special event at Cardiff SB, please click here. To view additional visitors services at Cardiff SB click here.